Jellybath at Songbird Prairie! Experience it here! 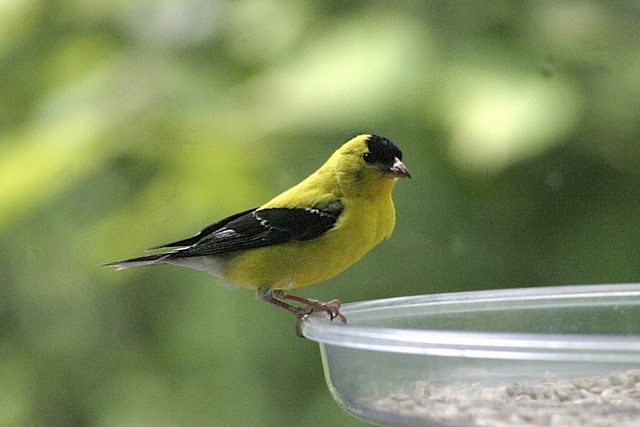 American Goldfinch is a permanent “guest” at Songbird Prairie! Cinco de Mayo Special: 05/05 saves you $55! En route, I listened to some of my favorite songbirds singing passionately to attract mates. Scarlet tanagers belting out their rough, two-syllable “chip-burr” notes, and rose-breasted grosbeaks singing sweetly like robins that had taken voice lessons. Black-throated green warblers sang a melodious five-syllable phrase that Beethoven would have copied, had he ever had the fortune to walk in an American forest. The chorus of yellow warblers, redstarts, towhees, veeries and the incomparably beautiful and flute-like wood thrushes produced the music fitting an entry to a magical setting. And so I entered chest-deep into my favorite pool as a yellow throat flittered out of the bushes to grab a mayfly. I took the shortcut, an overgrown trail now used only by deer. Along the way, like a royal carpet welcoming me, were star flowers, bluet, gay wings, bird’s-foot violets, jack-in-the-pulpits, azaleas, geraniums and lilies of the valley. I realized, as I paused to enjoy fully the spectacle of these wild and temporal beauties, that I was no longer in a rush to pass them by as I used to be many years back. Kenny Crawford’s annual guests showed up a few weeks early this year. But, as usual, the Grand Prairie man already had their rooms ready. The insect-devouring songbirds – famed and at times controversial – are leaving their winter home in Brazil and returning to North Texas backyards, parks and neighborhoods. They hang out in North Texas for a few months and then gather in roosts before their return to South America in late July. And that is when their massive numbers and the massive amount of their droppings can be a nuisance. Despite the downside, Lewisville is claiming credit as the home of the largest known purple martin roost in North Texas. City officials say Lewisville deserves the crown and they are wearing it proudly. A shopping center near Main Street and Civic Circle in the Denton County suburb serves as the roosting area for about 50,000 purple martins each summer. The sight of so many birds, famous for acrobatic flying, draws hundreds of North Texans to the spot each year. On Thursday, city parks and leisure employees erected three purple martin houses near the Fred Herring Recreation Center. Each one contains about a dozen nesting units. And they’re about to become even more visible in Lewisville. The city set aside more than $49,000 three years ago for a rebranding campaign to develop a new logo. Kunke said research and parallels between the bird and Lewisville residents led to a logo that prominently features the purple martin. “A lot of people grow up here, move away and then move back to raise their kids,” he said, likening the cycle to the bird’s migration patterns. Purple martins typically start showing up in North Texas in late February. They stay until about late August before heading back south for the winter. Colorful creatures: Purple martins are known for their distinctive deep purple and blue feathers. Many people find their singing intoxicating. Aerial artists: The birds are also famous for their speed and agility in the air. They do almost everything from mate to eat while in flight. Diet: They’re also loved for their food choices because they feast primarily on insects. It takes a village: While a mother and father typically raise the young, purple martin families often live in groups or colonies. Roosts: The birds will gather in large roosts weeks before their migration back to South America. Lewisville officials estimate that a roost there usually includes 50,000 birds, though some estimate past roosts at 100,000 birds.